Parker Braun seems a little out of left field. What's going on there? Apologies for the switched chat - hopefully more people can participate now that the comment box is working! I've got a story written but it should be posted soon. Here's the skinny: He's got strong family ties to Mizzou. Mom played for the Tigers. Aunt and uncle played for the Tigers. MU has shown some interest but needed to get the roster sorted out, then came in with an offer to for Parker to walk on this season and go on scholarship as a sophomore. His father, Donald Braun, is a doctor in Kansas. The family can afford a year of tuition, and then once three to four scholarships come off the books in 2019-20 he can become a scholarship player. He's talented enough to have offers from solid high-major programs. Nice pickup for Martin. We're all good now. Sorry for the glitch. I don't think that's what the pros will want him to focus on. He needs to improve his conditioning and physicality. He can shoot from 3. He needs to get stronger. He struggled against stronger defenders last year. If he gets in better shape he'll get more agile and that will help him find space inside and improve his explosiveness at the rim. Jontay a preseason All-American next year? Let's tap those brakes a bit. Porter will be a strong candidate for preseason All-SEC honors, but he'll have some strong competition. 11 SEC players are back next year who made either 1st- or 2nd-team all-conference or the All-Freshman team. If I were filling out my All-SEC preseason ballot right now, I'd start with Grant Williams of Tennessee, Auburn's Jared Harper and MSU's Quinndary Weatherspoon. From there, you've got Porter, South Carolina's Chris Silva, Auburn's Bryce Brown, Arkansas' Daniel Gafford, Tennessee's Admiral Schofield and LSU's Tremont Waters. You can make a case for all of those guys for preseason honors. And that's just in the SEC. If the season opened tonight who is your starting 5? geist/watson/puryear/porter/tilmon? I don't think Puryear, Porter and Tilmon start together. Puryear isn't a natural 3. You need more than two perimeter defenders, and Puryear and Porter can't play heavy minutes guarding the perimeter. Puryear probably makes more sense as a sixth man. He'll get plenty of minutes at the four. Tilmon and Porter aren't going to magically stop fouling as sophomores. Geist at the point, Watson on the wing along with maybe K.J. Santos, then Porter and Tilmon at the four and five. Why do you live tweet every football game when you know that everybody that follows you is watching it. Cute screen name. I very much do not live tweet every football game. I'll post score updates but I mostly stay off twitter during football games so I can actually watch the game. How many more potential roster spots/scholarships are still available now with Jontay coming back? Do you see any further semi-big additions or are they set now with their roster? Would other transfers be more inclined to come to Columbia given Jontay back? Thanks! Jontay's return puts Mizzou at the maximum 13 scholarships for 2018-19 season. Barring any unexpected departures or scholarship status changes, this is the roster they'll take into the season. Is Parker going to redshirt or be eligible right away? As far as I know the plan is for him to be available this year. Martin is expected to meet with reporters next week, so we could more know then. Now that declarations/pull-outs for the draft have been made, where do you see Mizzou fitting into the SEC next year? Great question. Tennessee and Auburn bring back the most known quantities from already very good teams. Kentucky returns two key pieces plus adds its typical haul of blue chip recruits. Mississippi State will be preseason top 25. Lots of talent returning to Starkville. LSU is bringing in a loaded class. I'd put Missouri in that next tier, along with South Carolina, Florida, Vandy and Texas A&M. Any updates on VanLeer's rehab? The guy takes a lot of flack but he has done nothing but bleed black and gold. If he can't play this year he could be medically retired and keep his scholarship to finish school, right? As of about a month ago Martin said the medical retirement issue could be a consideration but said it hadn't been discussed. I haven't heard anything lately one way or the other on that possibility. Looking at the basketball roster for this season, we'll have 7 players at or over 6'7", 4 of them at least 6'9". 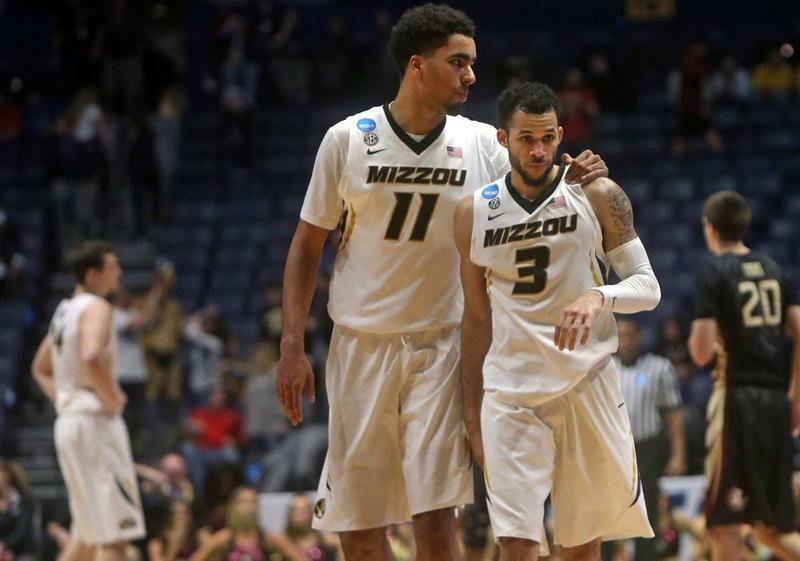 Do you remember a mizzou team with this much height? Mid-90s with Haleys and Hardge come to mind, but that's about it. Well, last year's team had the most 6-10 players in team history going into the season. So, on paper, is this that much team taller? You lose 6-10 Porter and add 6-7 Santos and 6-9 Braun, plus 6-10 Mitchell Smith. I wrote this last summer: According to Mizzou historian Tom Orf’s records, Norm Stewart’s team in ’95-96 featured the 7-foot Haley twins, Sammie and Simeon, plus Monte Hardge (6-11), Derrick Grimm (6-10) and walk-on Dustin Reeve (6-10). No other team in Mizzou history featured that many 6-10 players. Is Braun a guy who will make contributions year one? Maybe as a reserve. Hard to say right now but it'll depend on how other players develop this summer and buy into Martin's system. The combine revealed that Jontay had the highest body fat of anyone there. It's still perfectly healthy for normal people bit not great for elite athletes. Given that he's already a vegan, does the Mizzou staff have a realistic plan for improving his conditioning and body composition? Any word if Ehren Earleywine is going to coach again? He's currently the athletic director for the Jefferson City public school system. I wouldn't rule out a return to coaching but no telling if he'll coach baseball or softball or at what level. I think he's cut out to be a college baseball coach. He's been one before and no reason he can't do it again. What is the most booches burgers you have had in a day? Probably four. That's my limit. Ok, who picked Earleywine as the biggest Mizzou story? If it wasn't Earleywine himself, they should have their chat privileges revoked. By any measure, Odom is losing the recruiting game in St. Louis. Can you put your finger on reasons for this? Also, can you speculate on solutions? Last year was a big whiff for the Mizzou staff in St. Louis but don't count out Odom for the 2019 local class. Two important local recruits are visiting Mizzou this weekend: Vianney WR/RB Kyren Williams and Lutheran North OL Jack Buford. MU will have a stronger inside track to the recruits at Trinity Catholic with Terrence Curry as the team's new head coach. St. Louis is still vital for this staff. They're not going to wave the white flag and let other programs overtake the area without a fight. Mizzou does more position coach recruiting under Odom, which means the area targets are hearing from more than just the coach assigned to the region. There's a new energy on this staff with some of Odom's hires, including AJ Ofodile (receivers) and Brad Davis (O-line). When is seemed more likely than not that both Porters were leaving, we heard more commentary about the chemistry, or lack thereof, between the Porter family and the rest of the team. At the time, it seemed like the type of thing you only hear about when someone was leaving or maybe a by-product of MPJ's late season return...is that much ado about nothing now? Throughout the season, it didn't seem like an issue with Jontay. I stand by what I wrote late in the season about obvious tension within the team. Most, if not all of that was centered around Michael. Coaches and teammates genuinely like Jontay. He was invested in the team. Not to say Michael wasn't, but he was the center of attention in the entire lead-up to the season and then contributed next to nothing - and was still a focal point late in the year for a team that earned 20 wins without him. Some resentment was unavoidable. But I never sensed any of that directed at Jontay. On the floor he's very unselfish. That's a reflection of his character and personality too. I'll never forget after the loss to Florida State in the NCAAs, when Kassius Robertson came out of the game and his college career was over, the first person to walk with him off the floor was Jontay. He did the same after Kassius missed the final shot in the Georgia game in St. Louis. Not so much a question, but the off-season with basketball has been refreshing this year as compared with recent history in terms of players transfering out of Mizzou. I know there is still time for that, but nice to have a lot of the same guys and a fresh dose of newcomers to cheer for. It makes for a different dynamic. I'm sure the folks in the ticket department were pleased by Wednesday's news.